2. Dry roast the cinnamon, cloves, fennel seeds, cumin seeds, peppercorns, dry red chillies, cardamoms and coriander seeds for a minute. 4. Add oil to the pan and saute the onions until golden brown. 5. Grind the roasted ingredients, onions, water, almonds, turmeric powder and ginger garlic paste to a smooth paste. 6. Transfer to a pan and place over medium flame. 7. Add the chicken pieces, tomatoes and salt. 8. Pour 1 1/2 litres of water and cook for 15 to 20 minutes. 9. Switch off the heat and cool. 10. Then strain the mixture into another pan. 11. Reserve the rasam water and chicken. Discard the spices. 12. Shred the meat and discard the bones. 13. Place the rasam and chicken to a pan. 15. Add coriander leaves and mint leaves. 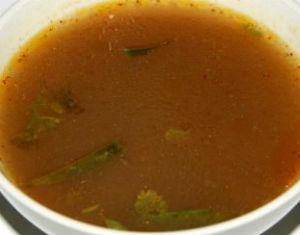 Feel free to comment or share your thoughts on this Chettinad Kozhi Rasam Recipe from Awesome Cuisine.